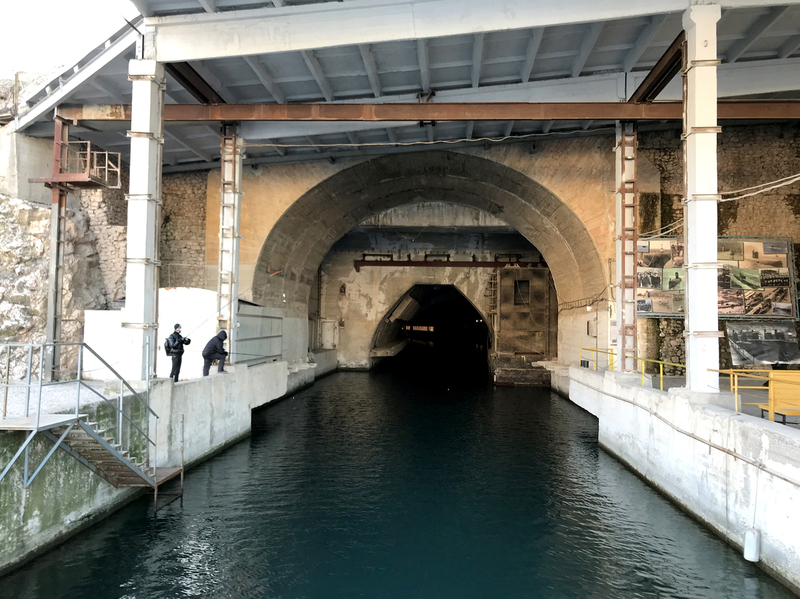 Now A Museum, This USSR Submarine Base Was Built To Endure U.S. Nukes — And Retaliate A once-secret underground naval base in Crimea designed to preserve Soviet submarines in case of a nuclear attack is now a museum with an anti-American message. 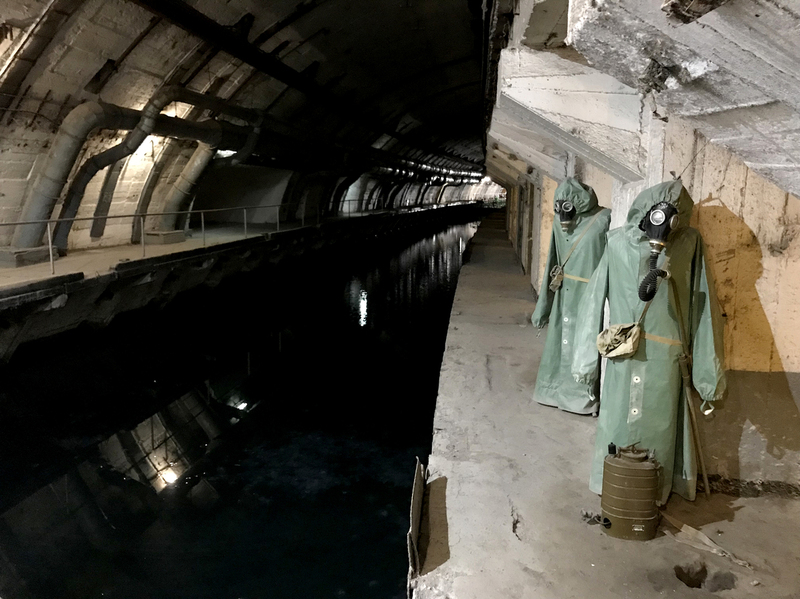 Hazmat suits hang next to the canal that leads from Balaklava Bay to the heart of the underground base. Yury Tarariyev served as a captain in the Soviet navy's 14th Submarine Division, which was based in Balaklava. During his lifetime, he saw Crimea go from being the Soviet Union's "unsinkable aircraft carrier" to Ukrainian vacation resort to occupied Russian military stronghold. The base is now a museum and Tarariyev, its director. "When we went out to sea, we took nuclear warheads on board and were ready to use them if ordered to," he said. A model of the Kiev aircraft carrier is on display in the museum. Today the Soviet warship is a theme park in China. Like many Crimeans, Tarariyev cheered Russia's takeover of the peninsula in 2014 after protests in Kiev brought a pro-Western government to power. At the time, Russian President Vladimir Putin justified the annexation by saying it would prevent Crimea's naval bases from falling into NATO's hands. Such reasoning resonated with locals whose lives were tied to Crimea's storied military past, which predates its history as a Ukrainian territory. Foreign invaders besieged Sevastopol twice in the span of a century, and Tarariyev's father helped liberate the city from Nazi invaders in 1944. "Thank God that everything is back to normal, and Crimea and Sevastopol returned to their home port," Tarariyev said about the Russian annexation. In a matter of days in early 2014, Russian troops fanned out and occupied the Crimean Peninsula using the bases of Russia's Black Sea Fleet as staging areas. A hastily arranged referendum — held under Russian occupation and in violation of Ukrainian law — was supposed to give the land grab the sheen of legitimacy. It was the first time since World War II that one European country had seized territory from a neighbor. Ukraine was too weak to resist, and Western countries didn't want to risk more than imposing economic sanctions on Russia. After the annexation, Tarariyev's museum came under the control of the Russian Defense Ministry, and a portrait of Putin went up at the entrance. "Somehow a plane was supposed to penetrate all our air defenses and drop a nuclear bomb here," said Tarariyev. "A mushroom cloud rises up, seawater floods the bay and covers the hilltops, and then a wall of water comes crashing down on this gate, which holds it back." Museum director Yury Tarariyev served as a captain in the Soviet navy for 15 years before the USSR fell apart. He supported Russia's annexation of Crimea. The words "Don't say everything you know, but always know what you say!" are written in Russian on a wall in red paint to remind the workers of the need for secrecy. 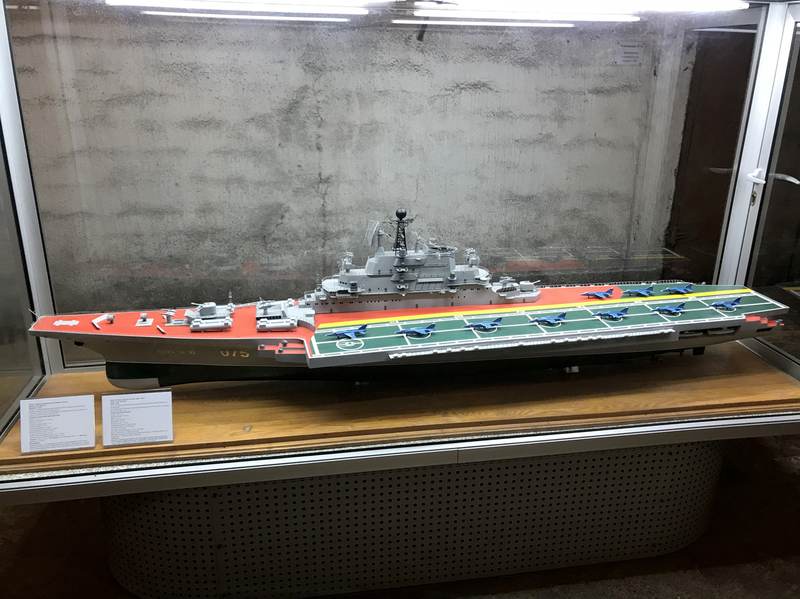 The museum's most poignant display is a model of the aircraft carrier Kiev, which was decommissioned after the fall of the Soviet Union and today is the centerpiece of a theme park in China. Fishermen cast their lines at the entrance of the once top-secret submarine base in Balaklava Bay. Bathed in red light, one display board about the U.S. attack on Hiroshima and Nagasaki shows Uncle Sam pointing his finger at the visitor next to the giant words "crimes against humanity." 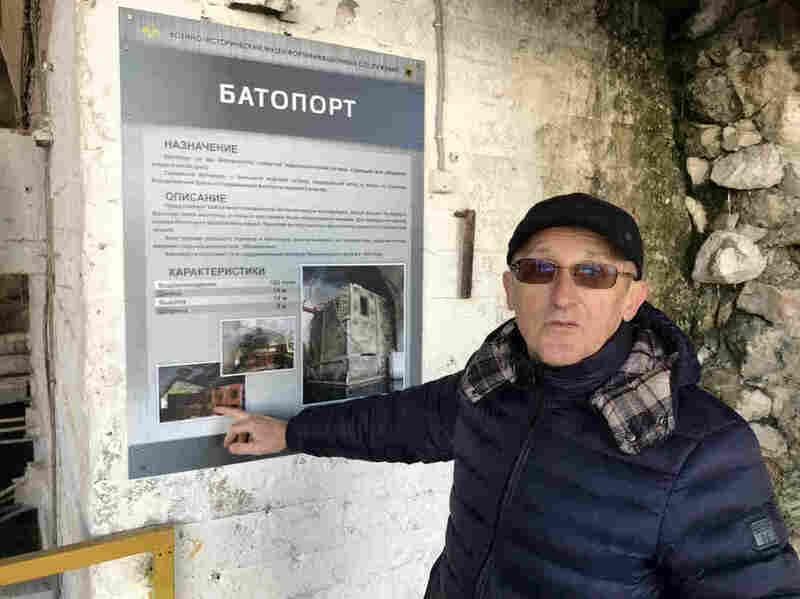 Another exhibit details a U.S. plan to destroy the Soviet Union with atomic bombs, justifying Moscow's own nuclear arms development and underground bases like the one in Balaklava Bay. "It's not a good idea to return to those times," Stepantsevich said. "It would be a great idea to be friends and to cooperate rather than to have a war, even if it is a so-called cold war."